The future USS Thomas Hudner (DDG 116) returns to Bath Iron Works after successfully completing acceptance trials. 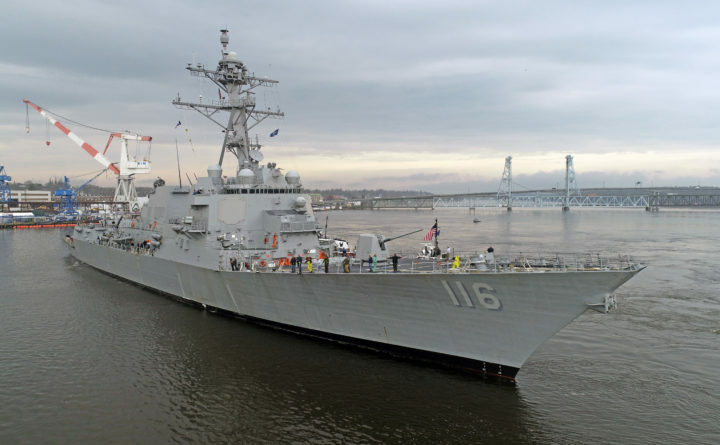 The U.S. Navy has awarded Bath Iron Works a $9.6 million contract modification to add new power distribution centers to three Arleigh Burke-class destroyers the shipyard is contracted to build. The integrated power node centers will replace the current centralized 400-Hz power distribution systems on the DDG 122 (the future USS John Basilone), DDG 124 (the future USS Harvey C. Barnum Jr.) and DDG 127 (the future USS Patrick Gallagher), according to a release. Work on the guided-missile destroyers will be performed in Bath and is expected to be completed by Nov. 20, 2022. The shipyard began construction of the DDG 122 in May 2017, and began construction of the DDG 124 in May of this year, spokesman David Hench said Tuesday. Construction of the DDG 127 has not yet begun. Follow BDN Bath-Brunswick on Facebook for the latest news from the Bath-Brunswick area and Lincoln and Sagadahoc counties.